Without any reasons, it’s essential to include carrots in your diet. As much as we love vegetables for cuisines, it’s said that carrots should be consumed in its raw form. So apart from including it into salads, you can always enjoy the goodness by preparing carrot juice. A glass of carrot juice every morning is actually beneficial for your health. So, if you not convinced thoroughly, then you should go through this health-blog. If you are seeking an answer to the question, ‘Is carrot juice healthy’, here’s what we have compiled for you. Read Also: Carrot Juice to Enhance Immunity and Boost Power! 3.1 How to Make Carrot Juice? 3.1.1 Was this article helpful? Owing to be a rich source of Vitamin A, carrots help in improving eyesight. These red-orange colored food items contain a pigment called as beta-carotene which directly gets converted into Vitamin A. Besides since night blindness is associated with Vitamin A deficiency, it’s important to consume Vitamin A rich foodstuffs on a regular basis. Due to the presence of anti-oxidants, carrots help in fighting free radicals and thereby slow down the process of aging. A person shouldn’t be bothered about ailments since it clears the system from toxins. After carrots are digested effectively, the foodstuff helps in removing free radicals that tend to damage the cells. This, in turn, helps in the development of cancerous cells. According to studies, 100 grams of carrot contains almost 30% of Vitamin A, 5% of Vitamin B-6, and 9% of Vitamin A. This collectively helps in fighting away free radicals. 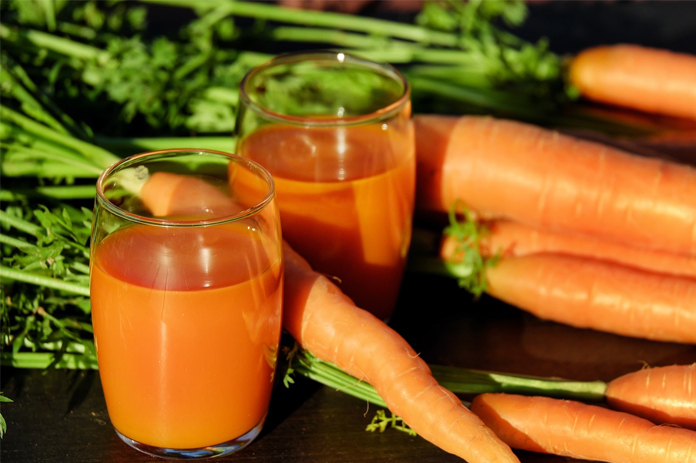 Since carrot juice is rich in different kinds of nutrients, a glass every day works wonders to enhance the immunity. It protects the human body against bacteria, inflammations, and viruses. The vitamins and minerals add on to bone health, make the nervous system stronger and contribute to the overall development of the brain. In order to enhance blood circulation and maintain the heart health, a person needs to be physically active, sleep adequately and help himself in decreasing stress. However, everything should be balanced with a proper diet that can have a positive effect. Apart from helping the heart pump more blood, dietary fibers help to remove plaque from the arteries. The nutrients found in carrots actually help to increase immunity. While the body develops the ability to fight toxins and bacteria, the juice enters the mouth and seeps in the gums and between teeth. Certain minerals present in carrots prevent cavities and tooth decay. The food item also removes stains from the teeth if they are eaten soon after savoring a meal. Beta-carotene actually works for healing any type of wound. So, a poultice meant for a wound uses carrots. In fact, if you have a skin infection or a cut, then carrot juice certainly enhances the capability of healing the wound. Not only would you help yourself in reducing inflammation but also reduce skin inflammation. While the prime purpose is served, the carrot juice enhances the skin tone and makes you look even more beautiful. As you grow year after year, wrinkles won’t start appearing in a short time span. If you wish to improve your memory and fight back cognitive decline, then carrot juice would surely benefit your health. Since there’s a significant drop in the oxidative stress on the brain, there isn’t an impact on the nerves and the brain would stay healthier as time passes by. Once you extract black carrot juice, 30 grams is equivalent to carrot juice calories. This is a little less than the calorie content in carrots available in the market. Usually, the reddish orange carrots contain 40 calories for every 100 grams. 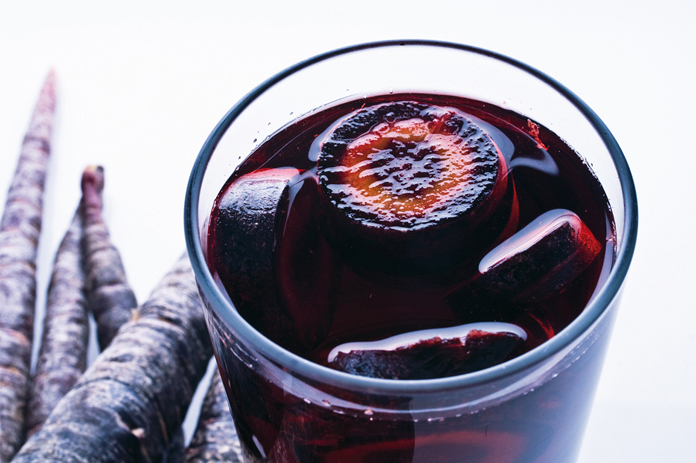 Apart from the calories, black carrot juice is high when the nutritional value is considered. It contains 1 grams of fat, about 180 mg of potassium, and 334 mg of sodium. Much to your surprise, carrots contain 1 gram of protein and 6 grams of carbohydrates. Do make a note that depending on your calorie needs the values can either rise or drop. When you’re planning to prepare black carrot juice at home, you need a single fresh cut Lemon wedge and eight cleaned black carrots. Juice always helps because they contain enzymes and are recognized for its nutritional value. In fact, life-enhancing micronutrients improve the health efficiently and in a faster way. How to Make Carrot Juice? The recipe is a bit different as compared to any other one. But, in case you are able to source healthy and flavonoid ripe black carrots, then you should give it a try. Step 1: Plug in the juicer and switch on the appliance so that you are able to clear away dirt. It’s always a good idea to visit the local store and shop for a juicer of a reputed brand. Step 2: Next, you need to wash black carrots under cold water and make sure there are no remnants of dirt particles left behind. Step 3: Depending on the capacity of the juicer, you need to take two carrots and crush them by slightly turning on the speed control. Step 4: Moving forward, you need to source a tall glass and start dropping carrot chunks into the machine. Step 5: Depending on the moisture content, you have to add the proportions of carrots in a much better way. Step 6: Once you are done, do garnish the nutritious drink and add one cut lemon wedge. Usually, a glass full of carrot juice is recommended before or after having your meal. Hope you seek an incredible difference after drinking organic carrot juice.